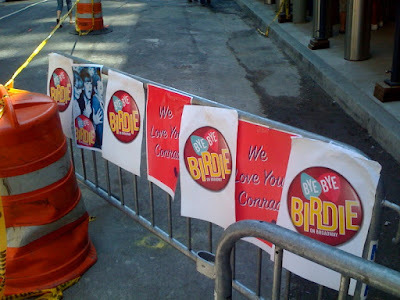 It was a beautiful, 90-degree summer day to wait in line on 42 St. for $10 tickets to the first preview performance of Bye Bye Birdie. That is, if you didn’t have a job. I stopped by the line for the ambitious marketing stunt when the box office opened at noon. At that point, there were 400 people stretching down 43 St. where the box office for the new Henry Miller’s Theatre is, through the covered passageway of the Bank of America Tower, and to the end of 42 St. at Avenue of the Americas. 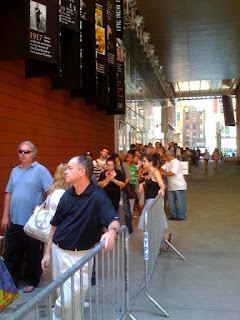 The line was moving sssslllloooww, but for those with the time (and skin) to burn, it was worth the wait for cheap tickets (up to two per person) to the first performance in the new Broadway theater on September 10.